I started this blog to record updates on my writing, and my thoughts on the writing process. At the time, I had written a handful of short stories and had some ideas for longer pieces. But, the Fates had other plans for me. I “retired early” from teaching high school, and co-founded Cinema Detroit with my wife Paula (Paula’s Cinema Club, TCM Party). One of the side effects of this is that my time for writing has diminished – which is alright because running an indie movie theater is pretty amazing. While I won’t be updating Alchemist’s Blend on a regular basis, I have decided to leave it up. So, browse the old posts, and occasionally a new post will appear. As always, you can send me a message via email (tkguthat at yahoo dot com), or find me on Twitter (tkguthat). And if you’re in Detroit, come see a movie! 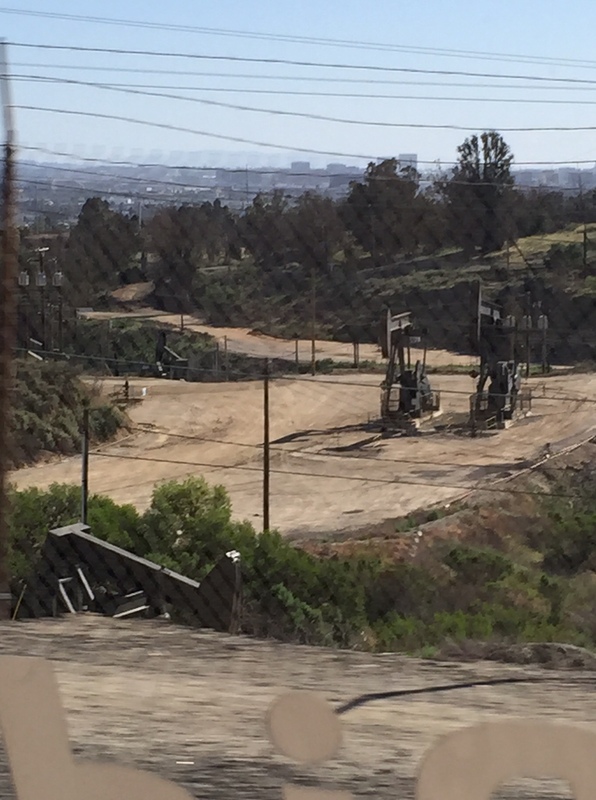 On the way in from the airport to our hotel, we passed by this oil field. 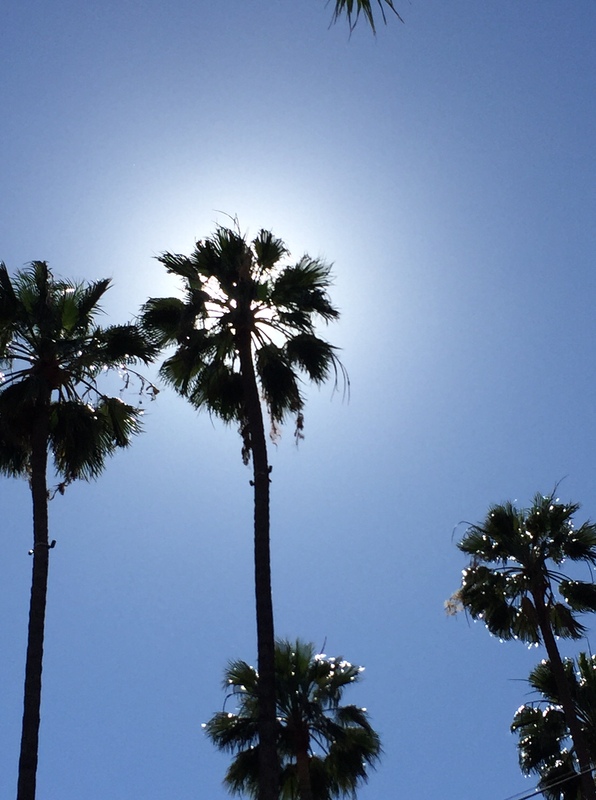 It reminded me of L.A. Confidential, and Raymond Chandler’s The Big Sleep (the book). 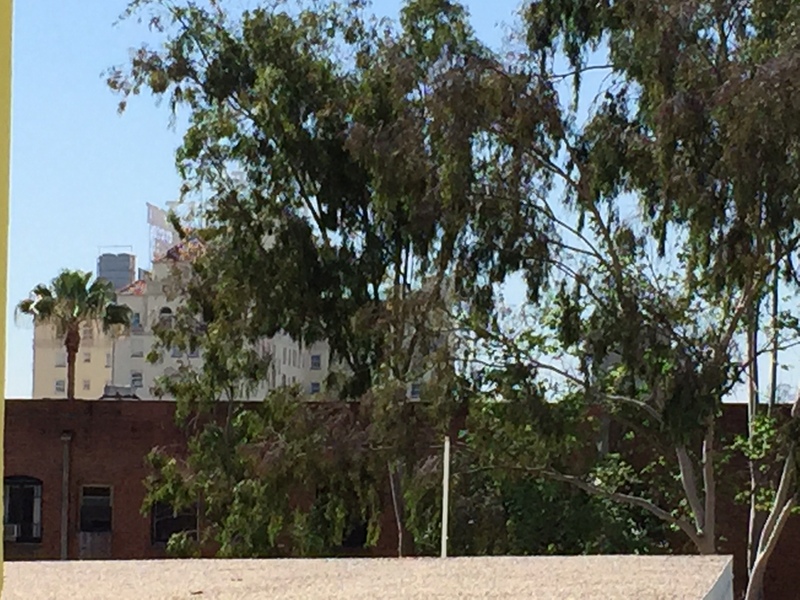 From our hotel room we could see the Roosevelt Hotel, the center of the festival. 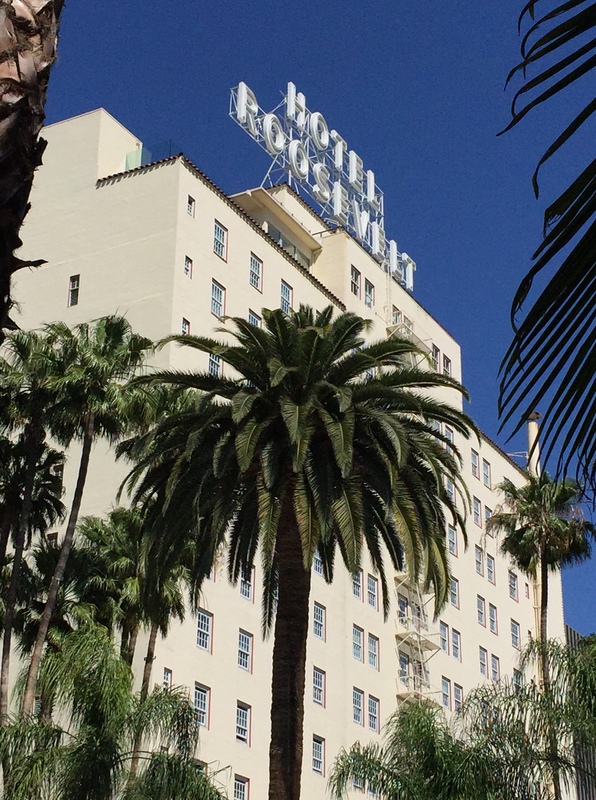 The Roosevelt Hotel in all its glory. The above pics were taken from beside the pool. 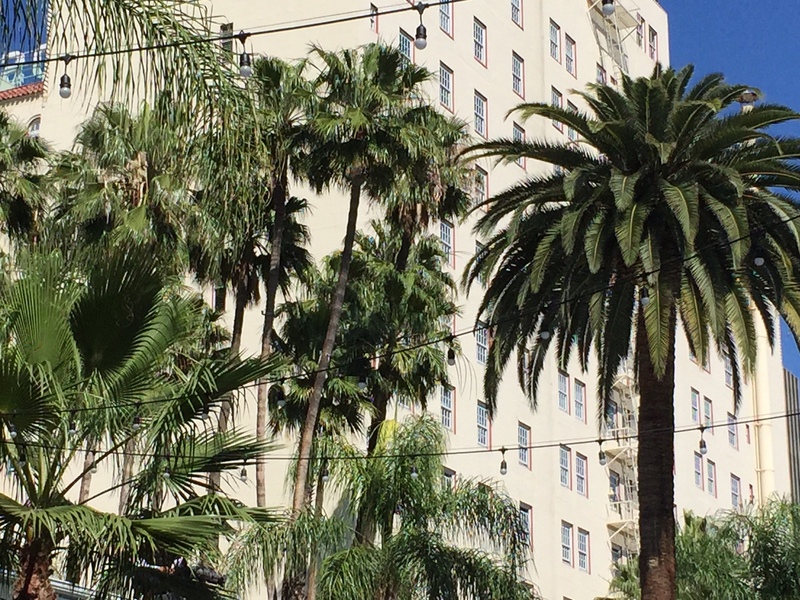 Bright sun, palm trees, and Art Deco architecture – that’s a lot of beauty in one place. 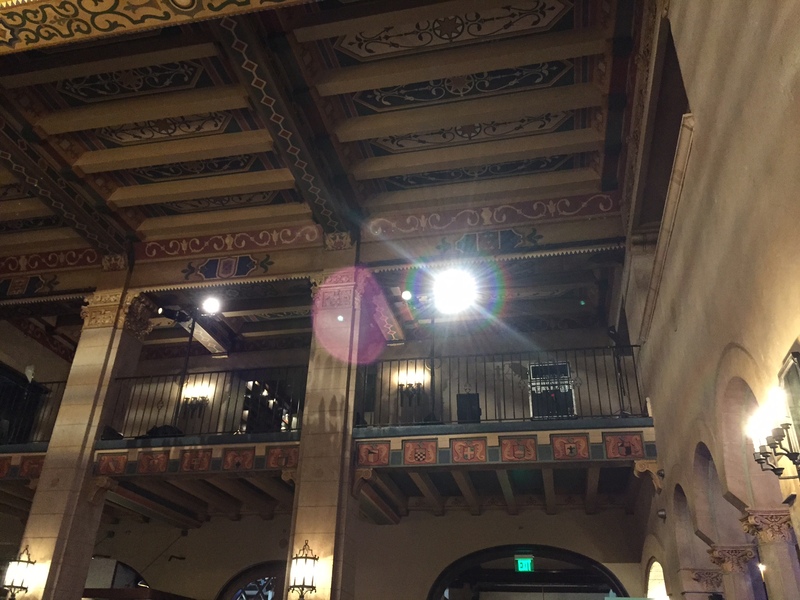 The main floor of the Roosevelt is decorated in a medieval-esque style. It’s very nice, but I find it very odd given that it’s in Southern California. 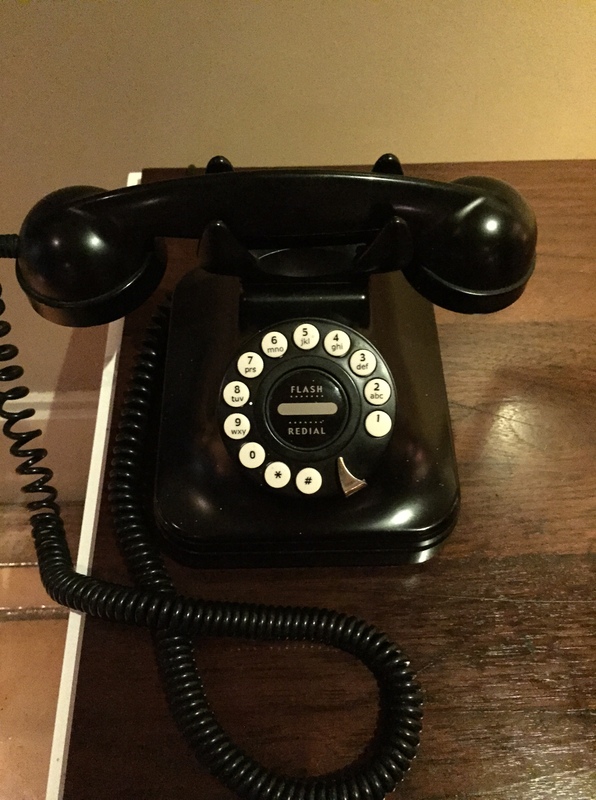 And the phone…someday I will own a deco-style phone like this one. As I was walking from our hotel to one of the festival sites, I noticed this sign. 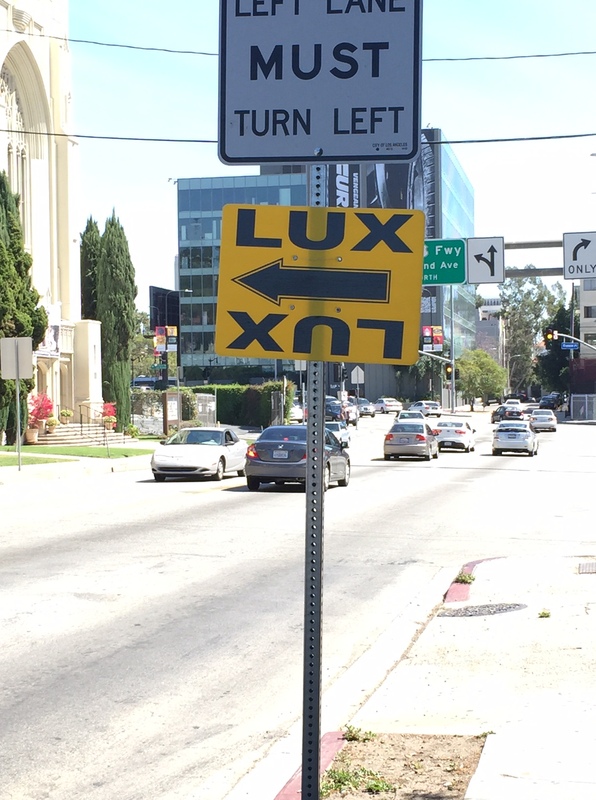 Probably a common sight for Los Angeles, but I’ve only seen a sign like this once in Detroit. 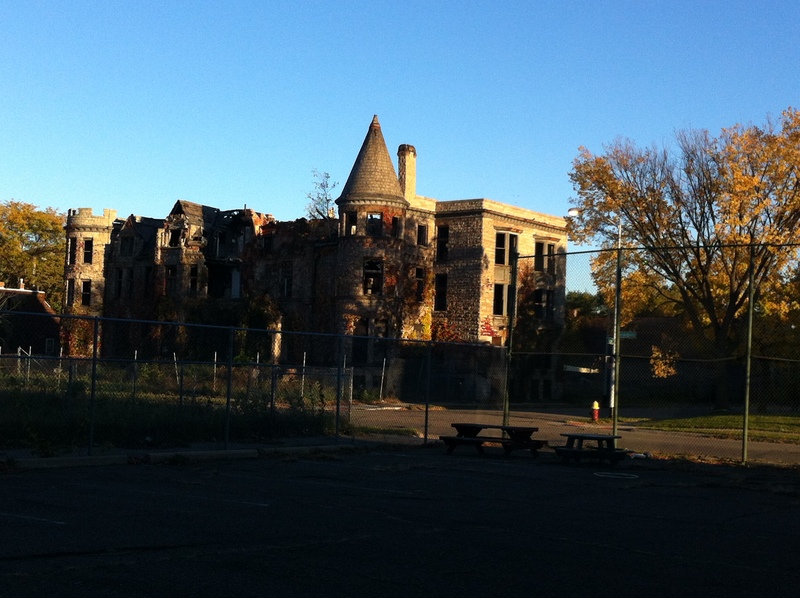 The one in Detroit was giving directions to the set of Superman vs. Batman. 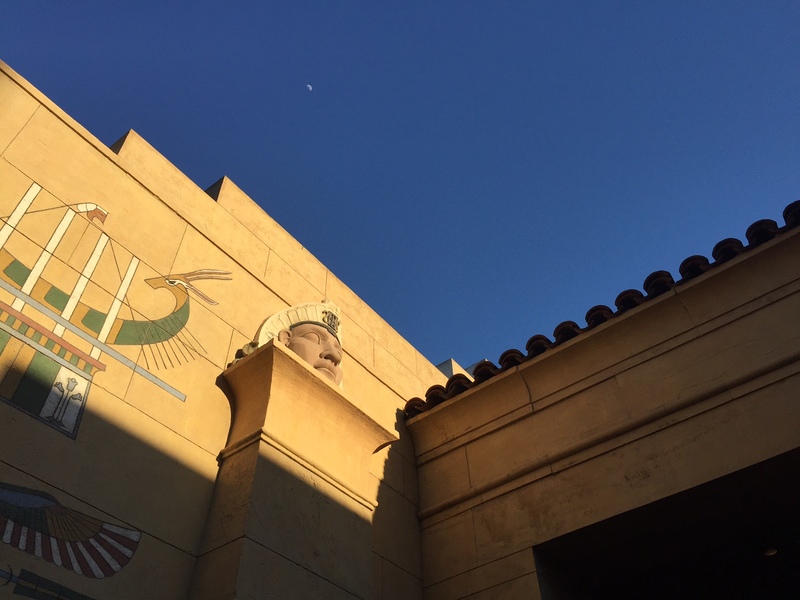 Above is the Egyptian Theater – my favorite of the movie theaters I’ve been to in Los Angeles. I love ancient history so going to a movie theater made to look like an ancient Egyptian tomb/palace is wonderful by itself. Moreover, while they show mostly classic movies, they do mix in the occasional Harry Potter marathon or Jackie Chan movie. So, I think if I lived in L.A. I would spend a fair amount of time at the Egyptian. I was standing in line to see The Apartment when I looked to my left and took this picture. 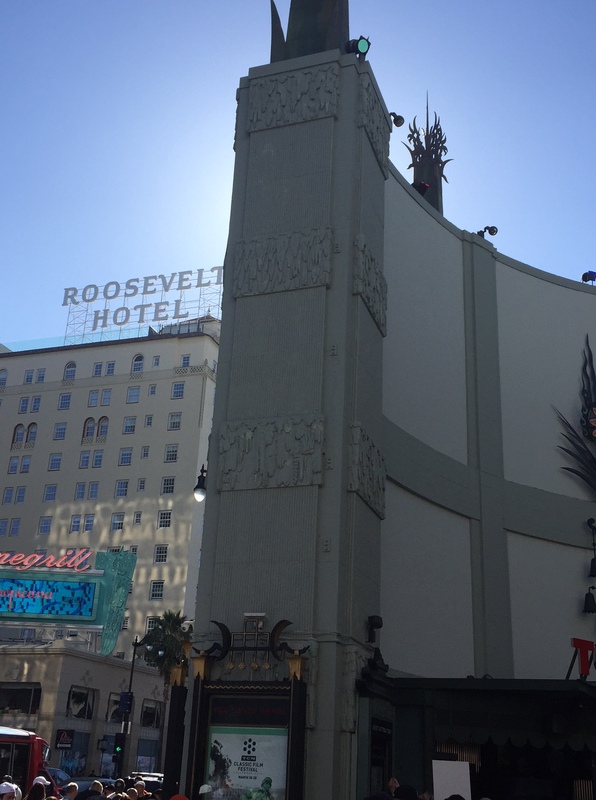 In the foreground is Grauman’s Chinese Theater, and in the background is the Roosevelt – site of the first Academy Awards Ceremony. 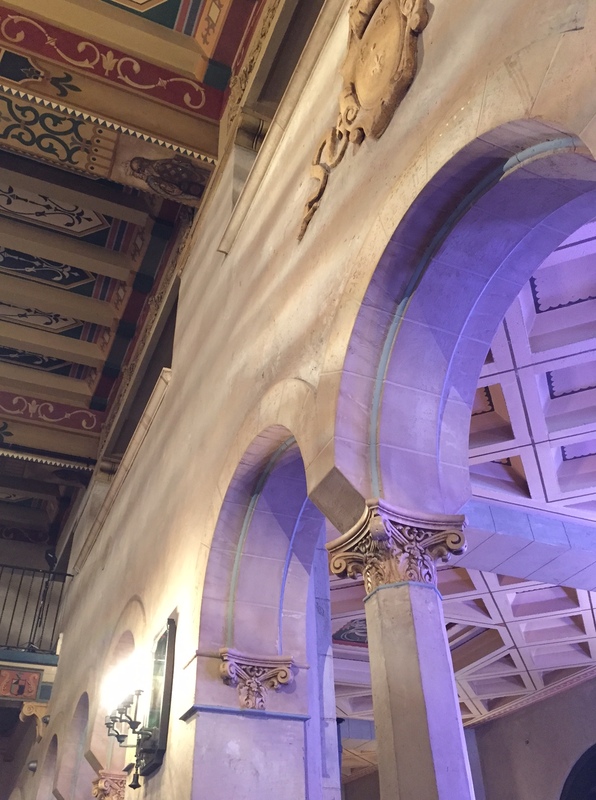 I always enjoy watching the movies at the TCMFF, but, for me, just being in these historic places, surrounded by the energy of literally thousands of classic movie fans, makes the trip worth it all by itself. But all TCM Film Festivals come to an end. 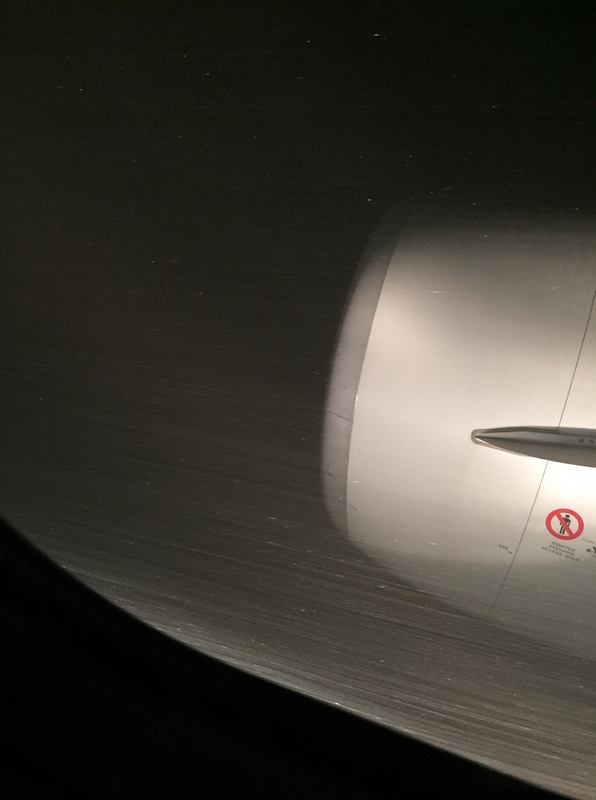 And on the way home this year, I had the experience of flying through a snow storm. As a nervous flyer, I hope I’ll never have that experience again. Well, I haven’t tried NaNoWriMo in the last few years. I wasn’t going to do it this year either. But about two weeks ago, an idea slowly began to form and it wouldn’t let me go. I kept coming back to it. Finally, I knew I had to write it. So even though I only have a scant 13 pages of notes and don’t even know the protagonist’s name, I’m going to do it. What if there was a woman who made a living by procuring art by any means necessary. And what if she was hired by an old man who lived in an old crumbling house to find the last reel of a lost film from the 1930s. 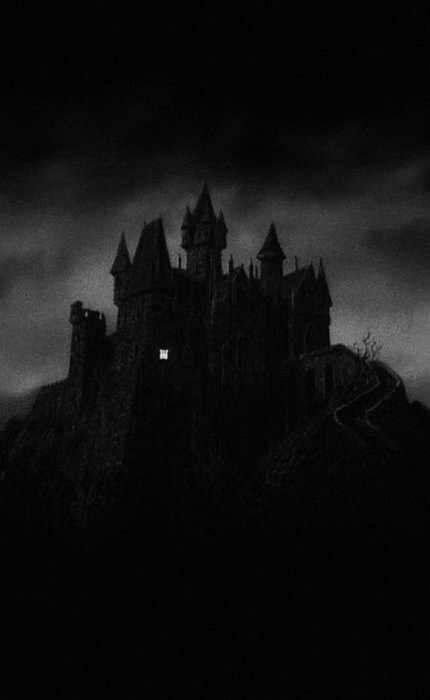 And what if this film was based on a known eighteenth-century Gothic novel, and the film’s producers spent a lot of money to make the film, because they were certain the film would be the next Dracula and its star the next Bela Lugosi. And what if for some reason the film was never released. 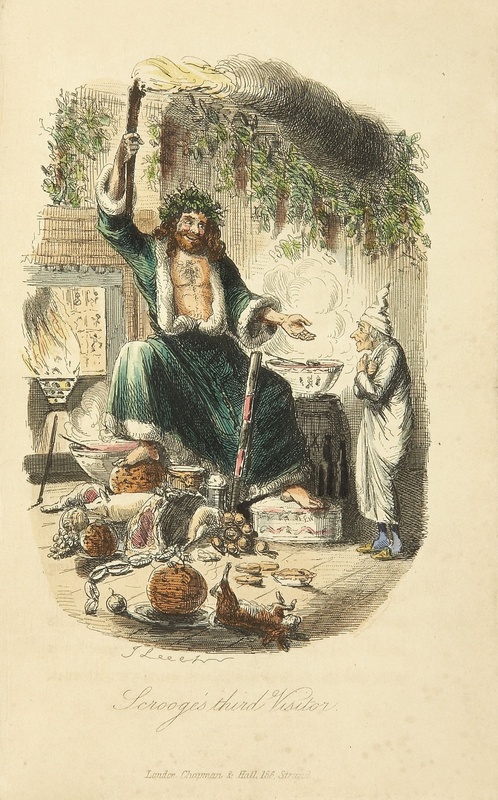 My grandfather read “A Christmas Carol” every year at Christmas, and I’ve inherited his love for it. The following scene is one of my favorite parts of the story. To me, it sums up what Christmas is all about. Or what it should be about. Enjoy, and Merry Christmas! And may everyone, regardless of creed or belief, experience some peace, joy, and happiness. No movie is perfect. 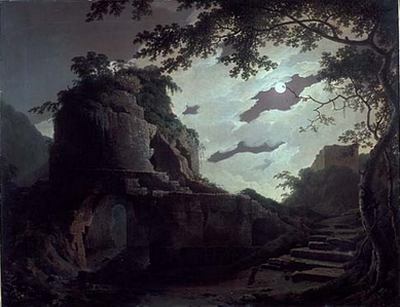 As with many historical movies, writers and directors take an event from here and an event from there, and put them together for dramatic effect. The result is something that is not literally true. However, it can be true to the spirit of the time. Indeed, it is not uncommon for historians to use pieces of historical evidence separated by small distances and small amounts of time to create an overall picture of a historical period. They just don’t present it as a cohesive narrative as filmmakers do. So, in Paths of Glory, we see a French commander ordering his own artillery to fire on his own troops, and we see privates randomly (and not so randomly) chosen for execution as punishment for an entire unit. Events like these did occur. They were rare (or perhaps even unique), but they are definitely within the realm of historical fact. That is, while the events portrayed in the movie are not “exactly what actually happened”, they are not affronts to the truth either. This brings me to what Paths of Glory does very well from the perspective of portraying historical events. 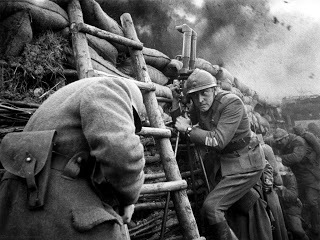 Kubrick and the cinematographer Georg Krause, accurately captured the visual look of the trenches, of no man’s land, and of the palaces where the generals lived. And most importantly, the movie accurately captures the behavior of the officers. We see an officer berate a soldier suffering from shell-shock. The officer claims that no such thing exists and that the soldier is merely a coward. We see suicidal attacks ordered by officers who dispassionately spout statistics and time-tables to show how logical the attack is and how certain it is to succeed. And we see officers oblivious to the realities of front lines. They have no real idea what is going on. Whether this ignorance is willful or a sign of their lack of competence depends on the individual officer. However, to the soldiers who lived in the trenches and were ordered to attack, it didn’t matter – in the movie or in real life. By 1917 (about the time the events of the movie take place), one million French men had been killed. At the time, the entire male population of France was only 20 million. It is no wonder the novel the film is based on was unpopular in some quarters when it came out in 1935. Paths of Glory is not a happy movie. It does not have a happy ending. But in addition to being a well-crafted tragedy, I think it accurately and powerfully captures the insanity of World War I. A lesson we should always remember. *Please note, I didn’t footnote anything. Indeed, I wrote this mostly from memory. I take full responsibility for any factual errors. However, even if I’ve gotten a detail or two wrong, I’m very confident in my overall conclusions. For those who’d like to know more, or to see my sources as it were, here are two books that were very influential in shaping my view of WWI. I highly recommend them. 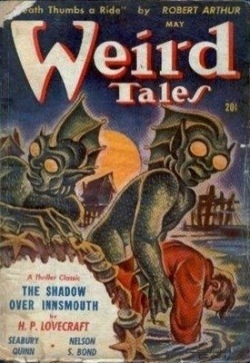 Since it’s H. P. Lovecraft’s birthday, I wanted to write about one of my favorite Lovecraft stories “The Shadow over Innsmouth.” I remember reading – but I can’t remember where – that Lovecraft didn’t like the story. Now, I’ve written a few things that I don’t like myself, and moreover, who I am to disagree with an artist’s opinion of their own work? But, I’m going to do it anyway. True, it does have its problems. One of the story’s underpinnings is a fear of miscegenation. This mixed with Lovecraft’s common use of non-Europeans as suspicious and/or villainous characters makes me feel that there’s more than a little racism and xenophobia at the story’s core. We will never know if Lovecraft had some agenda in mind beyond a desire to write a good weird tale when he sat down to write the story. So I’m going set this aside for the moment. The topic of whether we should avoid Lovecraft’s stories because of their racism and xenophobia deserves its own post (and many others who know Lovecraft’s work better than me have already addressed it before). 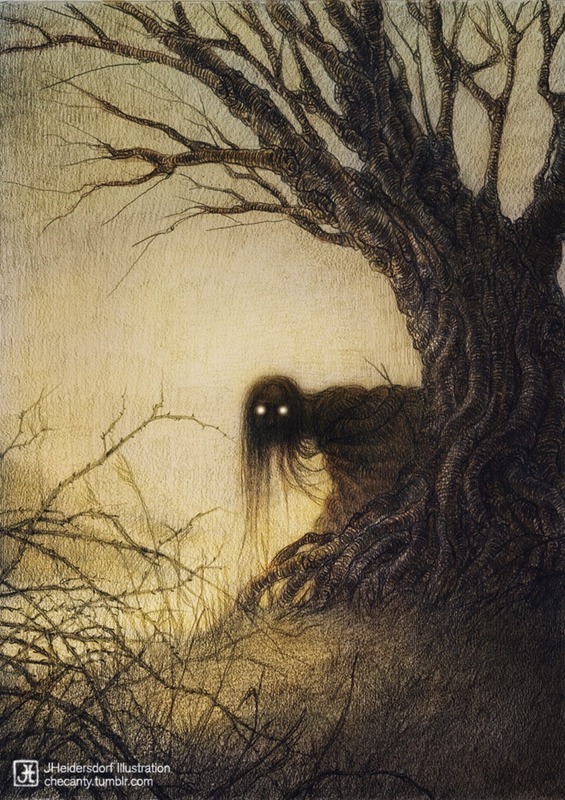 So let me talk about why “Shadow” is a wonderful example of an effective horror story. It starts out with a government cover-up, and quickly moves to a first-person confession promising the truth behind the cover-up. The reader is then treated to slowly built tension, as the narrator enters the decaying city of Innsmouth, and meets an old drunk who becomes an unreliable narrator to the story’s unreliable narrator (now that’s a nice trick). The tale climaxes with a chase where the narrator never sees his pursuers. Lovecraft shows real talent here, only hinting at the horrifying appearance of the horde that pursues the narrator through the streets of Innsmouth. We never see the monsters. We only hear them. This, to my mind, is key for once we see a monster it loses some of its ability to induce fear. 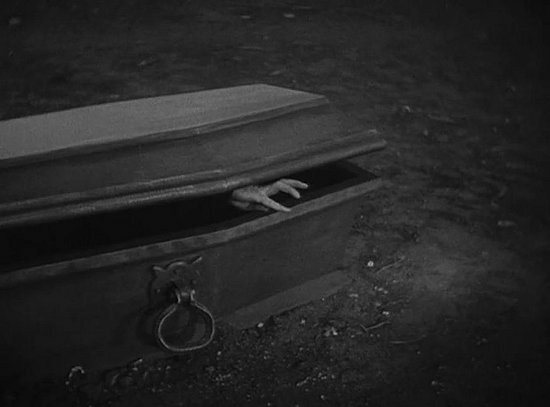 It was Lovecraft himself who said that the greatest fear was fear of the unknown. The best part of the story is the ending. I think it’s fair to say that most of Lovecraft’s endings induce a shudder. As readers, we find ourselves seeing the horror that is coming, even though the protagonist does not. And he rarely disappoints. Now in “Shadow,” Lovecraft does…well, I can’t say more without giving away important details. All I will say is that of all of the Lovecraft stories I’ve read, I like the ending of “The Shadow over Innsmouth” the best.